We’ve got some unsettling news for you this morning. 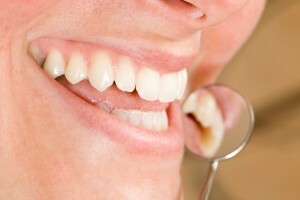 Did you know as many as 75 percent of Americans are suffering from gum disease? And that the condition has been linked to far more serious health problems — like cardiovascular disease, stroke and even breast cancer? It’s true. Fortunately, gum disease is incredibly easy to prevent. Keep reading for more information on how you can keep your gums as healthy as can be in 2016, from the trusted team at South Shore Dental Care! Also known as periodontitis, gum disease comes with some serious side effects. When left untreated, a whole host of issues can present themselves — the least of which, perhaps, is missing teeth. Knowing the symptoms of the condition can help you to seek treatment in the crucial early stages, when it’s most easily reversed. If you or a loved one are experiencing any of these symptoms of gum disease, don’t wait to schedule an appointment with your Massapequa dentist. If Dr. Stutman determines periodontitis is the source of your oral issues, you’ll be relieved to know you can find wonderful gum disease therapy at South Shore Dental Care. Of course, the best way to deal with gum disease is to make sure you never get it in the first place. Excellent preventive care can help to keep your gums healthy and whole — and you can maintain the best oral hygiene by brushing your teeth for two minutes, twice a day, flossing daily and visiting your Massapequa dentist twice annually for your dental exam and cleaning. Schedule your appointment in Massapequa today! If it’s been more than six months since your last dental checkup, or if you fear you may be currently dealing with gum disease, please don’t hesitate to contact South Shore Dental Care. We’re passionate about helping you and your loved ones enjoy a lifetime of healthy, beautiful teeth! Book your appointment with Dr. Stutman today! by: Dr. Stutman's Office at January 18, 2016 .